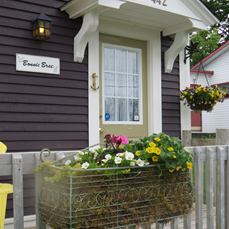 …our cozy Vacation Home in beautiful Bay Roberts, Avalon Peninsula, Newfoundland and Labrador. Our new upper deck overlooking Fergus Island is a great place to take in the breathtaking view of the Bay. Our home has everything you need for a perfect holiday or a short getaway! Our clean and comfortable 2 bedroom, 1 & ½ bathroom, tastefully decorated antique home offers an open concept living/dining room, complete with an electric fireplace, a custom-designed, fully-equipped kitchen, main floor washer/dryer, and is located cliff side with a great ocean view in historic Bay Roberts. We stayed at Bonnie Brae for 3 weeks ! Couldn’t find a better place to call home , all you need is your clothes and your toothbrush ! It’s a beautiful place to rent ! Just returned from a fabulous weekend at Bonnie Brae! Just what we needed…..a home away from home, with a quiet quaintness that only a little outport home could give us!!! So tastefully adorned and lovingly maintained, you sure do have a special treasure here!! Your pride shows! Just to wake up to the sounds of birds singing and the smells of new spring bushes and the salty air, is something many can only dream of…You are indeed living my dream……..Loved it! Loved it!! Thank you so much for your warm hospitality and friendly conversation …we truly enjoyed your company! and the comfy bed!! Just wish we could have stayed a while longer!!! We shall certainly do or part to recommend your treasure to whomever we meet, and we look forward to seeing you again in August!! Is there availability for thurs sept 3 and friday sept 4th? My family has travelled to many places and stayed in a variety of accommodations. We by far cannot top the Bonnie Brae…we spent a week at Bonnie Brae and felt so at home that we did not want to leave. The warm tones and comfortable furniture is just one of the many things we loved…the attention to detail in every room is above and beyond normal expectations, it was spotless and very well maintained. I was in awe of the kitchen and the bathrooms! Upon arrival you are greeted with two of the kindest people you could meet Bonnie and Charlie and of course a very friendly dog named Ollie. There is nothing you will need but your clothes food and your toothbrush….they have thought of everything. The two decks were well used and one of my favourite places was the Bonnie Vista…enjoyed morning tea up there every morning! Our stay at the Bonnie Brae will be in our hearts forever and a day! We will be back again and there is no place I would rather stay. Thanks again for sharing your little piece of heaven with us! Breathed a deep relaxation breath as owner, Bonnie, warmly welcomed me again. The inviting decor is a perfect mixture of cozy and newly restored haven of peace away from the crazy pace of our world. Impeccably clean and totally equipped, I enjoyed a couple of solo retreat days in project planning and reading in one of the three outdoor seating areas, and cooking for myself. Quiet, secure and inviting, I have made a “Bonnie Brae” visit a personal seasonal retreat – a gift for me!